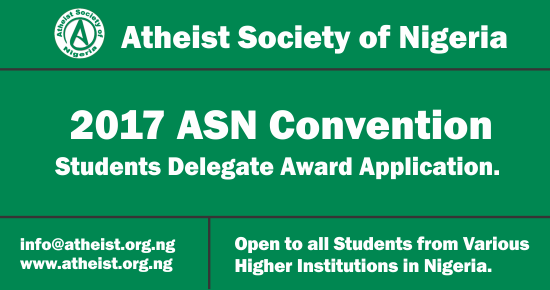 The Atheist Society of Nigeria (ASN) in collaboration with the International Humanist and Ethical Union (IHEU), is calling for applications from students planning to attend the National Convention coming up next month from their various institution if learning. The society will be sponsoring two (2) students each from ten (10) higher institutions who meets our criteria for selection. All applications should be sent to info@atheist.org.ng on a one page PDF format attachment. Alternatively, you can also apply at the ASN Website HERE. Application closes on 14th of October, 2017. Students who apply are expected to establish local chapters of the ASN in their various higher institutions after the conference in line with the objectives of the organisation.